K9: I’d knock Mayweather’s head off! 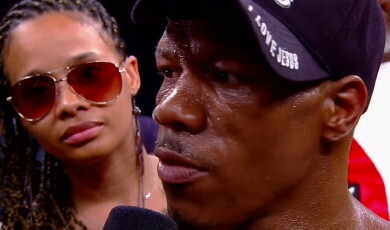 By Chris Williams: Former IBF junior middleweight champion Cornelius ‘K9” Bundrage (32-5, 19 KO’s) got kind of worked up recently when a fan told him he felt that Floyd Mayweather Jr. would beat him if the two were to ever fight. You have to wonder if K9 has the power and the talent to “Knock Mayweather’s head off”, then why didn’t K9 do that last month when he lost his International Boxing Federation 154 pound title to Ishe Smith. You could see that K9 was trying like mad to KO Smith for the entire fight, but Smith never was bothered by anything that K9 landed in the fight, and it was Smith who ended up hurting K9 late in the fight after hitting him with some big shots. Mayweather looks to be done with the junior middleweight division after his win over Miguel Cotto last year in May. If Floyd does return to 154, it’ll likely be for just one fight against someone like Austin Trout or Saul “Canelo’ Alvarez, depending on who emerges the winner of next month’s Canelo-Trout fight on April 20th in San Antonio, Texas. K9 likely doesn’t have a big enough fan base to attract Mayweather’s interest to move up to 154 to face him, especially now that K9 no longer has a world title in his possession. K9 can do himself a world of good if he looks to get a quick fight with Canelo or Trout, and beats one of them. Mayweather would likely be interested in facing him if he could do that, but it would be a tall order for K9 to emerge victorious over either of those guys, even if he could get a fight with one of them. I don’t think he’ll get either of those guys to fight him because there’s no point now with him having lost his IBF title. K9’s best option is to look to avenge his defeat by Smith or go after the WBO junior middleweight champion Zaurbek Baysangurov. Boxing » Floyd Mayweather Jr » K9: I’d knock Mayweather’s head off!